One year ago today you left us for a better place. Heaven must be aglow with you and Brett there. I pray you are together. We miss you so much. Your memories help us through. 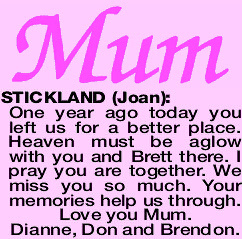 Love you Mum. Dianne, Don and Brendon.